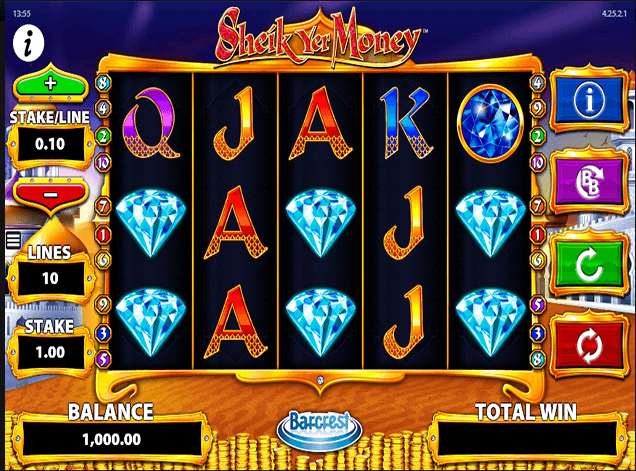 Sheik Yer Money is 5 reel, 10 payline colourful, Arabic themed online slot powered by Barcrest . If you have seen the Disney hero Aladdin or played earlier slots with Arabic themes you will for sure enjoy this game. This is a game filled with gemstones and bonus games. . The Magic Lamp acts as the Wild Symbol on Sheik Yer Money Slot and it takes the place of all other symbols to help complete winning combinations. The Magic Lamp symbol appears as stacked on the reels. The great thing about this slot game is that winning combinations do not only start from the left hand side but it can happen anywhere as long as 3 identical symbols are adjacent to each other on a payline. During the Big Bet spins, all Mystic Lamp symbols appearing on the reels are transformed into any symbols on the reels to that is likely to trigger a winning combination. There is also a randomly triggered Sheik Shake feature that can be triggered on any non-winning spin. When this is initiated, the reels Sheik will appear to shake the reel into a guaranteed winning combination.